I have mentioned in earlier posts that I have a niece who is allergic to eggs. That is difficult for a godmother to hear, particularly a godmother who bakes. Thankfully, Meg has a mom who is pretty impressive at working around that allergy. When I visited my sister just before Christmas last year, she was tasked with finding mini doughnuts for a holiday party or some project for Meg’s class. Seems they were making reindeer out of mini chocolate covered doughnuts and snowmen out of white powdered ones. Only problem, Meg can’t eat doughnuts. God, I don’t think I will ever get used to saying that. My sister came up with a way to make Meg doughnuts without eggs. And all you need are three ingredients: refrigerated biscuit dough, canola oil and to elevate the fried biscuit to doughnut, a sweet topping of choice (sugar, chocolate, and glaze). Yep, that’s it. Brilliant! I have always had a fear of deep-frying. I mean, it is just an accident waiting to happen. But if I could get past my fear of using a candy thermometer I could just get passed this. So my sister, being the far more experienced in the frying sciences, helped me get over that fear. Now I just need her to get me over my addiction to fried biscuit dough. Bring the oil up to 350° degrees. I used a candy thermometer to track the temp. Yep, I used both a candy thermometer AND deep-fried dough. I am turning into a downright badass in the kitchen. Release the refrigerated biscuit dough from each cardboard tube and pierce a whole in the center of each one. I use the handle part of a wooden spoon. Stretch the hole because the doughnut will close in once it enters the oil. Let simmer for a few minutes and then flip the doughnut over. Do so until the doughnut is an even, brown color. Take out of the oil and put on a cooling rack. Top with your choice of sweet. Adding a sweet is key. 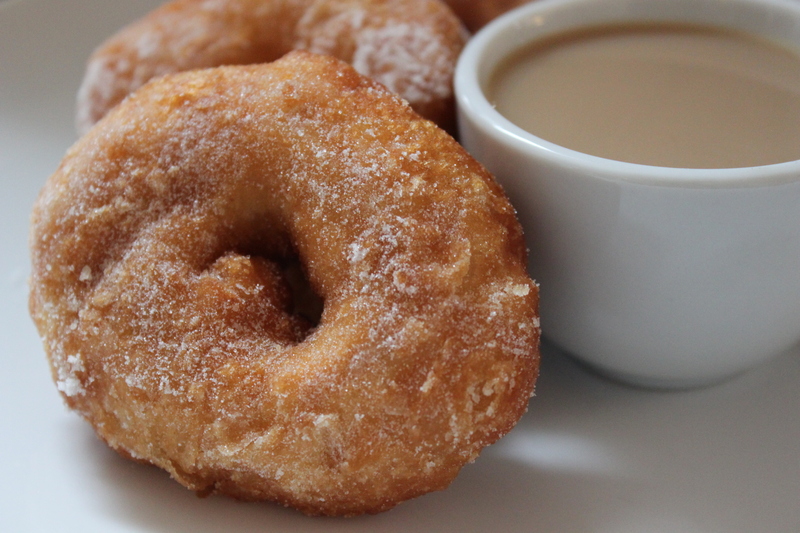 It is what brings the elevates the biscuit to a doughnut. I prefer using castor sugar (aka superfine) because it is more subtle than granulated sugar and does not have the mess of powdered. (To make castor sugar, just pulse granulated sugar in a food processor for a bit.) Then dip the doughnut before it cools completely. Next, make some café au lait and enjoy!!! Holy Lord – thank you! So freakin awesome!!! I Love reading you. You make me laugh and that’s like a bouquet of roses!